Keith Rowe – see October 2 listing for bio. Vancouver-based percussionist Jeffrey Allport approaches the physical nature of his chosen instrument through a variety of preparations and implements to liberate a unique palette of sounds. Respecting each carefully extracted tone, thump and scrape in addition to the silence from which they are borne, his exploratory improvisations inhabit minute sound worlds, eschewing the grand gesture. In addition to solo work, Allport has enjoyed a lengthy collaboration with Tim Olive, releasing three CD’s since 1998. They have also toured in Canada, the US, Western Europe and Japan. Frequently participating in once-only groupings has led him to performing and recording with a wide variety of improvisers, including saxophonist John Butcher, trumpeters Axel Dörner and Greg Kelley, and harpist Rhodri Davies. Seattle’s Gust Burns is a pianist, improviser, composer, and music presenter. While at Western Washington University, Gust spent two years studying improvisation and composition with Canadian virtuoso pianist Paul Plimley, in addition to receiving his B.A. in Philosophy. Gust plays improvised/composed new music from a perspective influenced by both jazz and “classical”/avant-garde traditions. He also sees the rap and hip-hop music he grew up with as an influence on his musical sensibility. The pool of musicians and artists with whom Gust works is ever growing and expanding: improvisors such as Jack Wright, Ron Samworth, Frank Gratkowski, Daniel Carter, Damon Smith, Wally Shoup, Michael Bisio, Tom Swafford, Adam Diller, Jesse Canterbury, Greg Campbell, Reuben Radding, Travis Baker, Garth Powell, Bob Marsh, and many others. An organizer as well as a performer, Gust is continually attempting to stimulate the Seattle improvised/new music community with new venues, series, and festivals. Gregory Reynolds is very active in the new music scene in Seattle and performs frequently as a solo artist as well as with the groups Xiao Gu Fang, Ficus Trio, Murderous Copulation of Birds, Black Lodge and When Bells Breathe. He also collaborates in many one-off improvisational meetings with such notable performers as Stuart Dempster, Frank Gratkowski (Germany), John Edwards (UK), Gianni Gebbia (Italy), Amy Denio, Jack Wright and Toshi Makahara (Philadelphia). His inimitable approach towards saxophone playing is informed by a love for the textures and tones found in electronic music and guitar feedback as well as a deep appreciation for space and natural sound. Currently he is finishing up the composition of a suite for a unique chamber ensemble (violin, contrabass, accordian, alto sax) that is based on the exploitation of physical movements inherent in the playing of each instrument with the goal of creating a more present and communicative sound world. Since arriving in Portland in 2002, Leif Sundstrom has continually developed an improvisatory approach to music that maintains a symbiotic relationship with his environment and company. In addition to drums and percussion, Leif also maintains an ethereal sensibility using old record players, equalizers, and preparations to produce modulated feedback and gestural sounds. In addition to organizing and performing music throughout the west coast over the past three years, he has had the fortune of working with Bob Marsh, Gust Burns, Jack Wright, Toshi Makihara, Doug Theriault, Andrew Lafkas, Joe Foster, and Chris Cogburn, among countless valuable others. 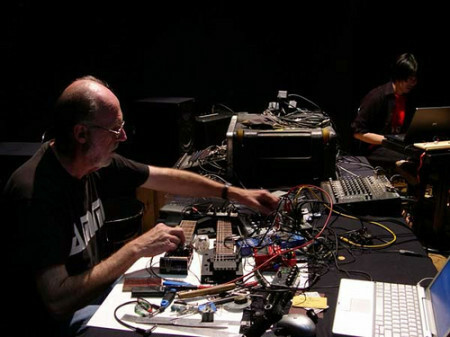 In Portland Leif continues to explore longstanding collaborations with Jean-Paul Jenkins (in the group Super Unity) and Bryan Eubanks, with whom he collaborates in the electronics duo GOD.